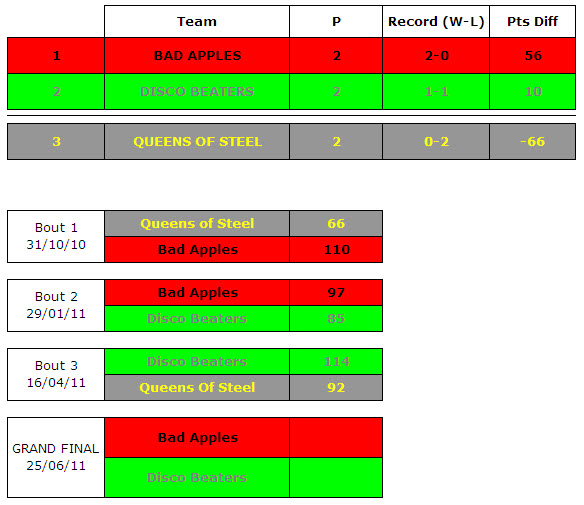 Disco Beaters will be joining Bad Apples in the first CCR Intra League Grand Final, following an impressive comeback to defeat Queens of Steel by 114 – 92. A see-saw bout saw the Queens storm into a 59-8 lead with just a few jams remaining of the first period and even though the Disco Beaters hit back to get within 37 points, a half time 64-27 lead looked to have put them firmly in the driving seat. The Disco Beaters half time team talk certainly did the trick, with them getting back on level terms 7 jams into the 2nd Period and then eeking their way ahead until a Power Jam, five from the end, effectively sealed the victory. So its now onto 25th June, for the winner takes all Grand Final!